Florence, located in the northwest corner of Alabama, is the county seat of Lauderdale County. With some 39,000 residents, it is also the largest and principal city in the Florence-Muscle Shoals Metropolitan Statistical Area. The statistical area includes Florence, Muscle Shoals, Sheffield and Tuscumbia. While there is not direct access to a major interstate from Florence, Highway 43 and Highway 72 merge just north of the city. Access to Interstate 65 is 45 miles east on Highway 72. Local industry is also served by the Tennessee Southern Railroad, which runs from Florence to Columbia, TN and the Port of Florence on Pickwick Lake. Florence is served by Northwest Alabama Regional Airport, which provides flights to Atlanta for continued travel. Florence City Schools provide the majority of student education in the city; however, there are four private schools as well. The University of North Alabama is also located in Florence and is the oldest state-certified university in Alabama. Florence is like any other city, and its citizens experience various personal injuries on a daily bases. Injuries caused by another party can involve, but are not limited to, car accidents, truck wrecks, medical malpractice, defective products, work-related accidents, construction accidents, dog bites and nursing home abuse. If you or a loved one has been injured through no fault of your own in the Florence area, call the Florence personal injury attorneys at Hollis Wright as soon as possible for a FREE consultation. The Florence personal injury attorneys at Hollis, Wright, Clay & Vail will promptly investigate your claim, and if your personal injury claim is deemed viable, you will likely be entitled to compensation for lost wages, pain and suffering, emotional distress, medical bills, disfigurement, permanent impairment, and perhaps other damages as well. For your safety and well being, it is very important that you seek medical attention as soon as possible after sustaining an injury caused by an accident. Also, medical records detailing your injuries and treatment are critically important in any personal injury matter, as they are the best source of information that an attorney can use to establish the severity of your injuries and obtain the compensation to which you deserve. Due to the nature of personal injury cases, it is imperative that you call an attorney as soon as possible after the accident, but of course after you've received proper medical attention and treatment. If there were witnesses to the accident, an attorney can contact them immediately and get a statement. Witnesses undoubtedly forget many of the pertinent details as time passes and will become disinterested in helping out. Additionally, there are strict timelines in Alabama as far as filing a law suit after a personal injury incident. If you don't comply with these deadlines, you will be barred from pursuing your claim. 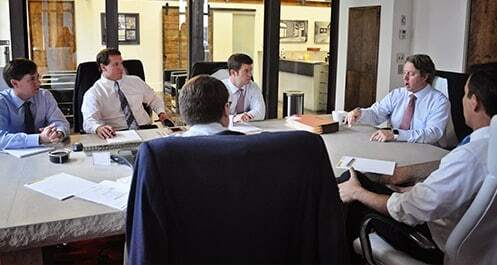 The Florence personal injury attorneys at Hollis Wright fight aggressively for each and every client. Although many personal injury cases do not actually go to trial, our attorneys will prepare for each claim as if it will end up in the courtroom. We invest substantial resources—financial, time and otherwise—to ensure you receive any and all compensation to which you are entitled. Additionally, we use our own investigators, as well as outside consultants and experts, to ensure your case is well-prepared for trial. The attorneys at Hollis Wright have combined legal and courtroom experience of some 150 years and are accustomed to handling cases that involve complex and difficult issues. If you or a family member has been injured or killed through no fault of your own, contact the Florence personal injury attorneys at Hollis, Wright, Clay & Vail, P.C. for a FREE and private consultation. We will review your options and determine what compensation you are entitled to receive. Also, all cases are handled on a contingency fee basis, which means we don't get paid unless we recover for you. Don't let insurance companies and large corporations take advantage of you. Call us 1.844.LAW.TALK or 205.324.3600. You may also contact us here.